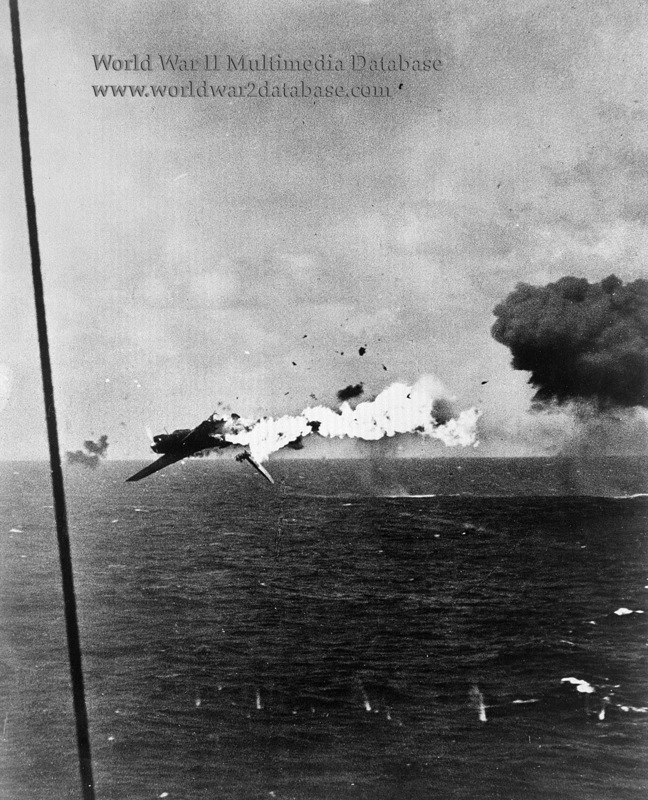 Nakajima B6N Type 1 Tenzan (Heavenly Mountain; Allied Code Name Jill) explodes after receiving a direct hit from one of USS Yorktown's (CV-10) 5-inch guns. The pilot made a lone attack; between the Carrier Air Patrol and the heavy anti-aircraft artillery it was almost a suicidal gesture to attack without support. Yorktown was operating with US Navy Rear Admiral Charles A. Pownall's Task Force 50 against Kwajalein, Ebeye, Roi and Wotje to suppress counterattacks against the new American bases at Tarawa and Makin Atolls. Cruisers IJN Nagara and Isuzu were damaged. Collier Asakaze Maru, cargo ship Tateyama Maru, subchaser Takunan Maru #7, guardboat Mikuni Maru #5, and damaging transports Eiko Maru, Kenbu Maru, Mikage Maru #18, cargo ship Kinezaki Maru, and auxiliary Fujikawa Maru. 55 Japanese aircraft are destroyed. USS Lexington (CV-16) was damaged by an aerial torpedo during the operation. These were the first successful airstrikes in the Marshall Islands.